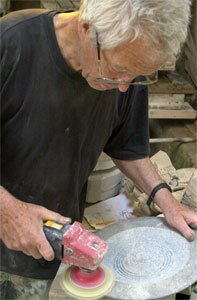 Tony Viney was born in 1933 and ran his own publishing agency for fifteen years in London before moving to Dorset . He lives in an isolated old stone barn, where he generates his electricity from the wind and the sun at Worth Matravers within easy reach of the quarries where he gets his stone..
His set up his workshop in 1984 in the shadow of Corfe Castle with a view to extending the use of the local stone beyond its traditional role as a building material and for church furniture. In the course of the next few years he developed his own techniques for turning polished stone plates and bowls to individual designs which could be cut as thin as a ceramic. He sells his output throughout the world including America and Japan where a short film was made about him. His hobbies include reading and music. Work is held in collections around the world.